Read the full list from Thrillist. As cracks in Detroit’s seemingly impenetrable silver lining (aka, the sky) start to appear, it seems that we’re ready to rush out and enjoy the few fleeting and sweet months of Bob Seger’s favorite season. While holing up in a dark, dank dive may have its appeal in the light-deprived winter months, by the time spring hits, it’s imperative to recharge batteries with some sunlight, a patio, and numerous pints. 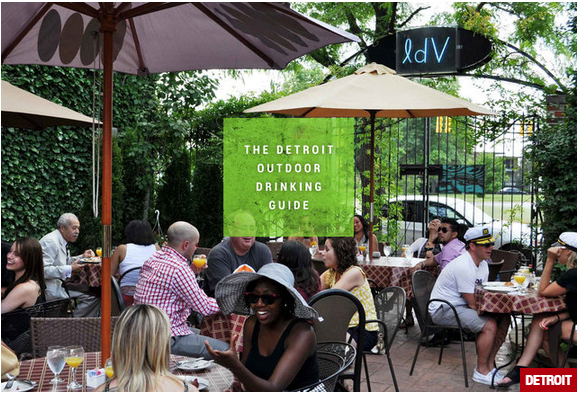 With this in mind, these are Detroit’s finest bars that let you imbibe in the fresh (or fresh-ish) air. This entry was posted in Bars, Corktown, Downtown Detroit, Eastern Market, Greektown, Hamtramk, Midtown Detroit and tagged 3rd Street, Berts Warehouse, Bookies Bar N' Grille, Bronx Bar, El Barzon, Exodos Rooftop, Green Dot Stables, Hopcat - Detroit, Kelly's Bar, La Dolce Vita, Los Galanes, McShane's Pub, Motor City Brewing Works, Nancy Whiskey's Detroit, Old Miami, Old Shillelagh, PJ's Lager House, Seva Detroit, The Alley Deck, Traffic Jam & Snug, TV Lounge, UFO FACTORY, Whiskey In The Jar, Whitney Restaurant, Z's Villa.